A dapper Robert Redford entered the Newseum in northwest Washington. An American flag waved digitally on a monitor over head. The sandy haired actor/director was celebrating the premiere of his new historical thriller “The Conspirator” at an after party hosted byCapitol File Magazine. 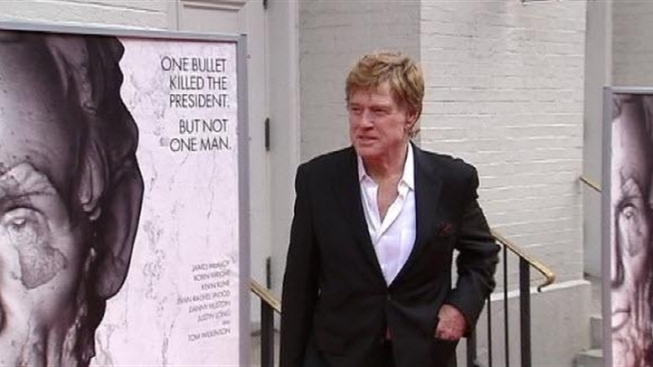 Redford directed the film largely focused on the only woman charged in the assassination of Abraham Lincoln. Robin Wright (Jenny in "Forrest Gump") plays Mary Surratt, who owns a boarding house where John Wilkes Booth and others met to plan the attack. Surratt, however, claims she’s innocent. "It was a story no one knew about and it was tied to an event that everyone new about. That's what interested me," Redford said on the red carpet at the premiere. The premiere was held at the iconic Ford’s Theatre, where Lincoln was assassinated. And though the movie was shot in Savannah, Ga., Redford said plenty of research was done to get the facts right. At least two long-time Washington-area residents who attended the premiere and after party believe researchers did their job. “I’ve been here for 32 years. I know the history, visited battlefields. I looked for imperfections in the movie that could make me say, ‘Gotcha,’ but I couldn’t,” said Arlington businessman Thomas Culligan. From director Robert Redford, a film about Frederick Aiken (James McAvoy) and his efforts to defend Mary Surratt (Robin Wright), the only woman implicated in the assassination of Abraham Lincoln. Opens April 15. “I felt like it was history exactly how it happened. True to life,” said lifelong Virginia resident Sherie Gapriel. Yet, who better to ask than career politico, MSNBC’s Chris Matthews, who also saw the movie. “It’s great," he said. "I think it’s very American. Somebody standing alone, fighting for justice. All the things I value." Matthews also commented on the possible parallels between America now and then. To get the joke you may have to watch the movie, but Redford said everyone will have a different opinion. "All the parallels in the film are up for reviewers, critics and filmgoers to find. They are certainly there. I didn't invent them," said Redford. The actor doesn’t get in front of the camera for “The Conspirator,” but you will see him, front and center, on the cover of Capitol File’s next issue. The movie is already out in theatres.